Looking N at Newmarket Farm Cottage excavation. A beautiful sunny day, quality finds, and some interested visitors. A couple of people who missed our official tours got a private tour today. 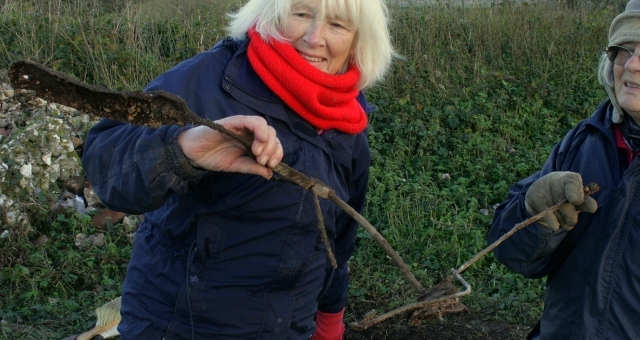 One of them joined us digging and wishes to return as a new volunteer. 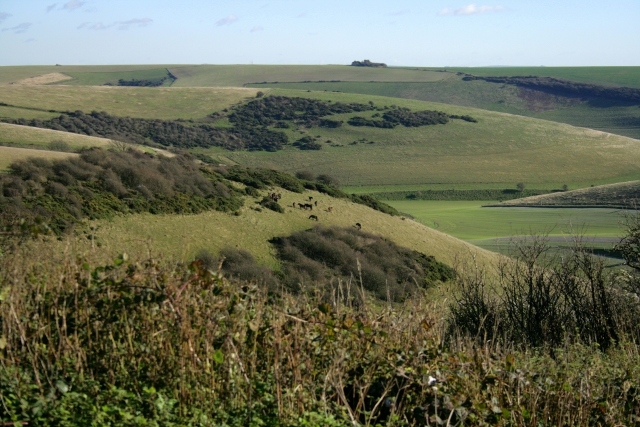 View of Exmoor ponies on Castle Hill NNR from demolition rubble mound. 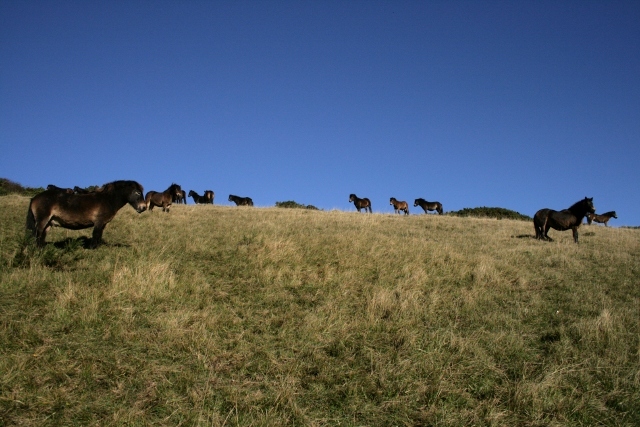 Exmoor ponies Castle Hill NNR. 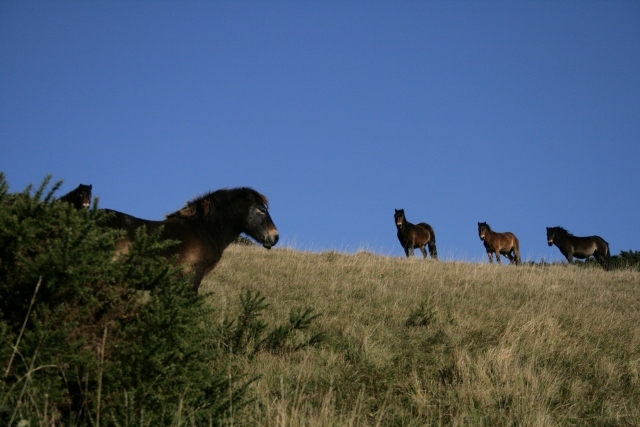 Exmoor ponies, Castle Hill NNR. 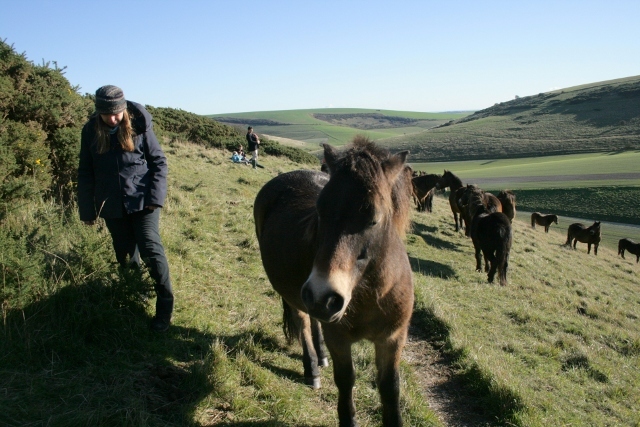 A walk was taken to visit Castle Hill NNR’s Exmoor ponies. They are mostly a little nervous of visitors, but one or two are friendly enough to introduce themselves. However, when the ponies later came up to the dig site and started to investigate our archaeology, they were somewhat less welcome. Looking WSW at garden boundary wall to N of cottage. Looking ESE at garden boundary wall N of cottage. The north side of the front garden wall has now (just about) been completely excavated down to the surviving 1942 ground surface. 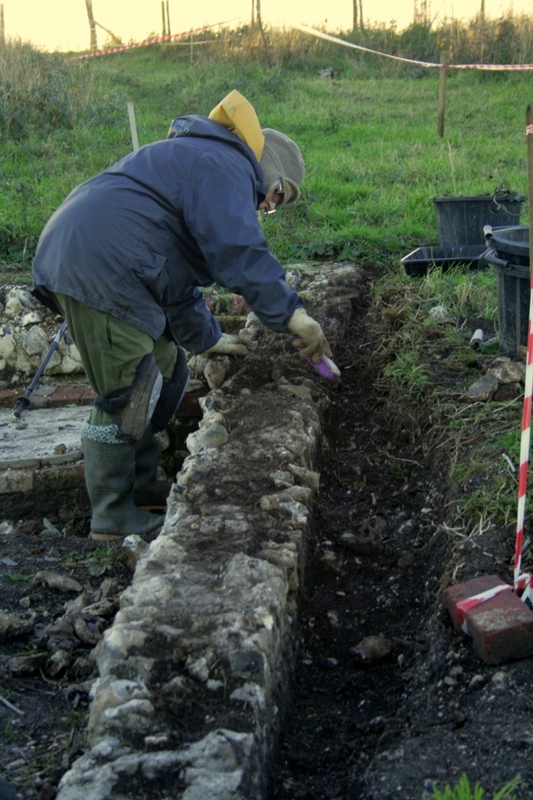 At its western end it was about a foot above the ground surface on the other side of the wall. 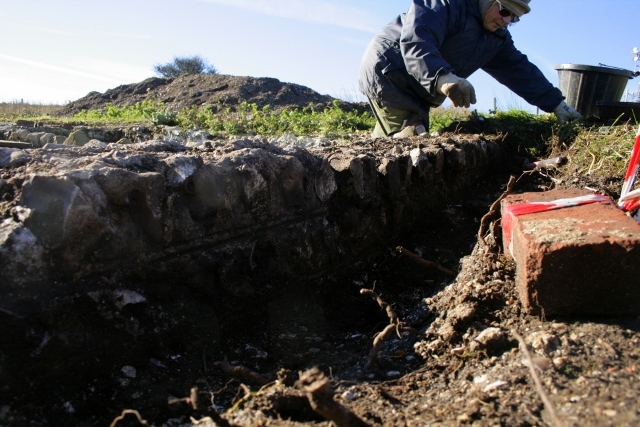 The chalk rubble found beside the remains of this wall was backfill; when a small sondage was dug down through it, a mortar base was discovered underneath it, part of the wall’s foundations. Looking SW at garden boundary wall N of cottage. Composite of photos looking S at garden boundary wall, N of cottage; click for enlargement. 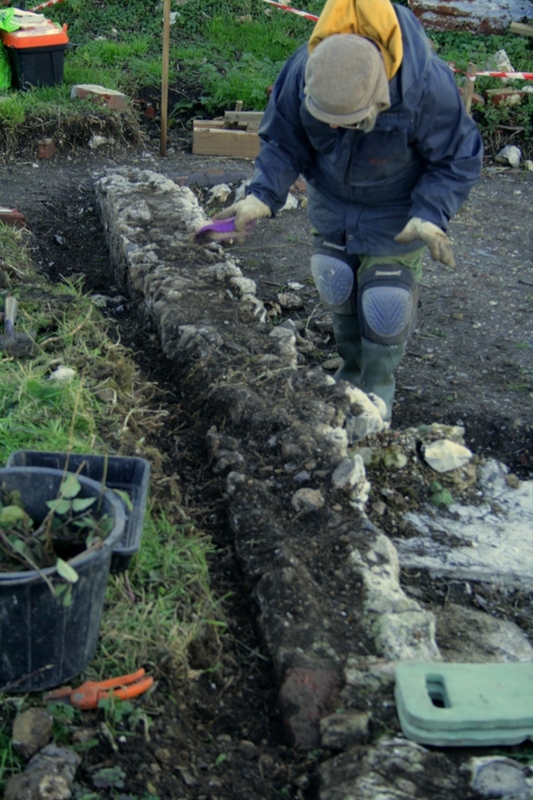 The ‘double struck’ lines in the pointing between the courses of flints roughly followed the contours of this ground surface, indicating that the top of the garden wall was not horizontally stepped, but sloped downhill. Finds were few, but included a metal object which resembled either a latch to a door, or more likely, a hoof pick; it had a nicely wrought twisted iron handle. 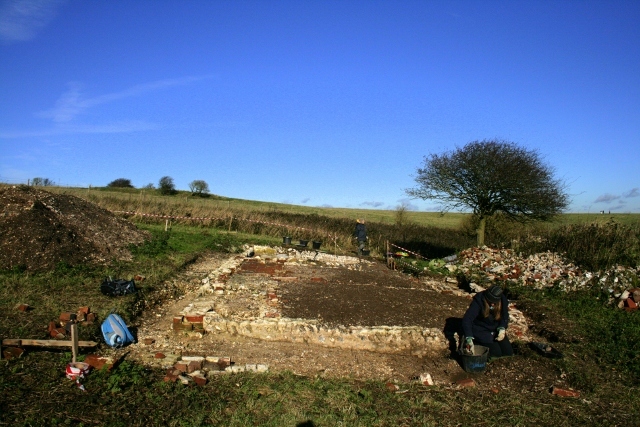 Looking E at excavation of external face of chimney. 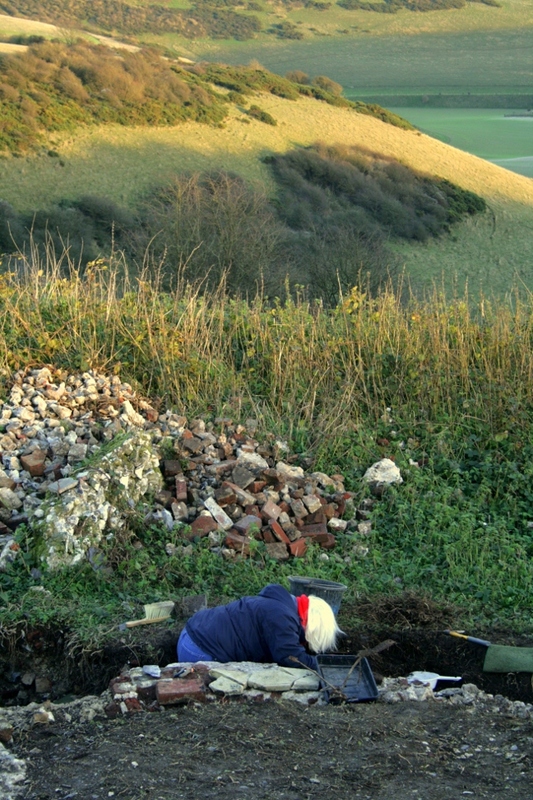 Looking NW at excavation of external face of chimney base. 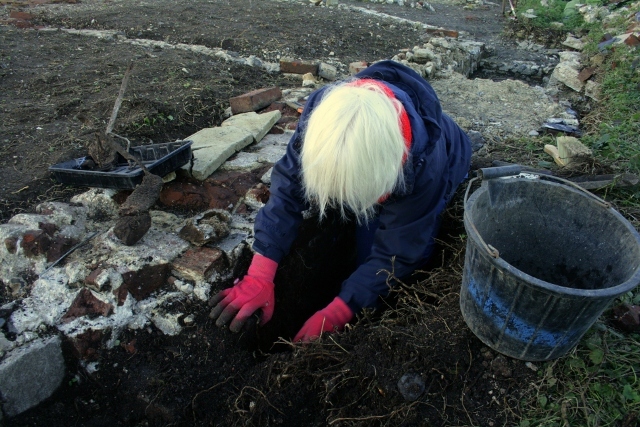 The immediate area outside of the chimney was also further excavated, continuing the previously dug trench in a southerly direction, along the east side of the cottage. Strange find from demolition rubble beside chimney base. Strange object from demolition rubble beside chimney base. An exceedingly strange, over 2 foot long, piece of rusty iron ‘something-or-other’ was excavated out of the deep layer of demolition rubble. 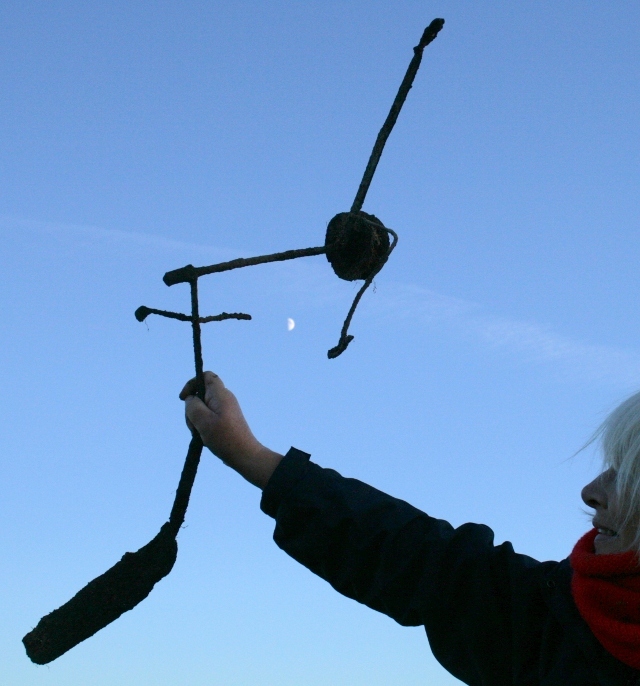 It consisted of several pieces of metal, all connected together, as if it was a tv aerial designed by Heath Robinson to communicate with E.T.!! Looking SE across dig site. 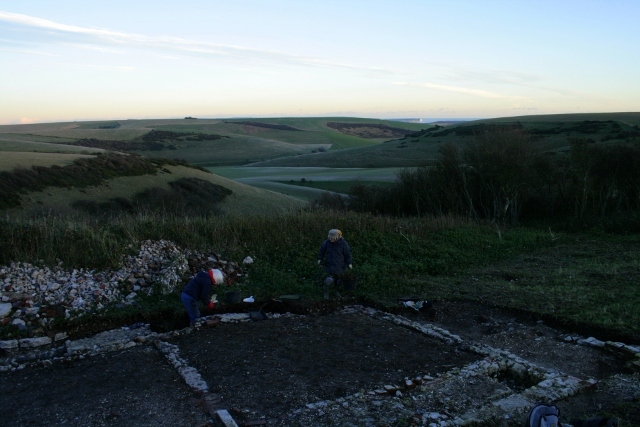 Looking SE at view beyond dig site. 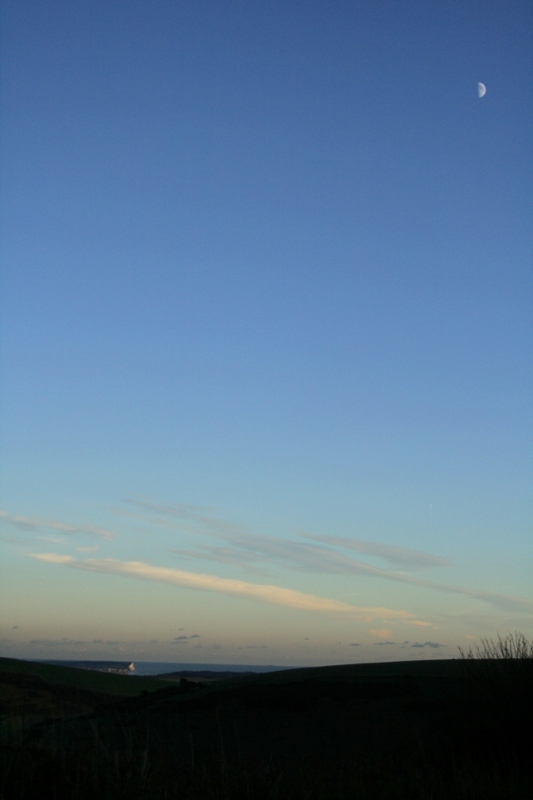 A beautiful sunset, with a half moon high in the sky, as well as magnificent views across amazing scenery, formed the perfect end to a really nice day! 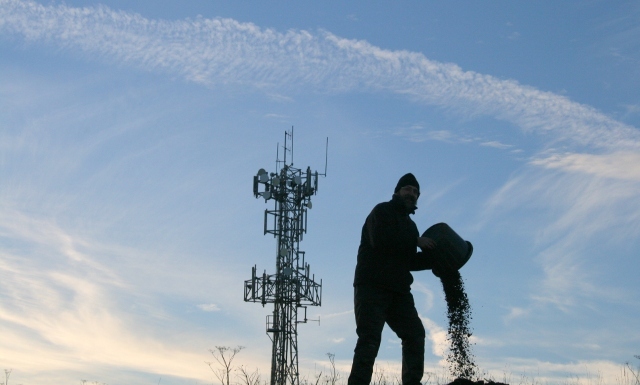 Proof that I don’t just take photos of other people working!